Pyrazinamide (PZA) is one of the drugs used in standard, first-line TB therapy for drug-sensitive patients. It was discovered in 1954, though it wasn’t until approximately 30 years later that it became part of the standard TB treatment. Adding it to TB treatment enabled the shortening of treatment from 9 to 6 months. PZA is unique among current TB drugs in that it demonstrates impressive sterilizing activity and synergy with other drugs in animal models of TB but its activity itself is not potent against M.tb in a test tube. The use of pyrazinamide has also been shown to reduce the relapse rate of TB patients after cure. 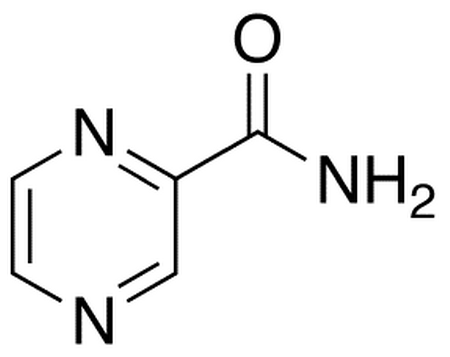 Despite extensive study, pyrazinamide’s mode of action is not fully understood. Pyrazinoic acid (POA), the active moiety of PZA, has been shown to inhibit various functions at acid pH in M.tb. It is widely accepted that POA may not have a specific target, but rather that cellular acidification causes inhibition of major processes. Experimental evidence suggests that PZA diffuses into M.tb and is converted into POA by pyrazinamidase (PZAase); the in vitro susceptibility of a given strain of the organism corresponds to its PZAase activity. PZAase is also called nicotinamidase and metabolizes both PZA and nicotinamide. Once converted, a portion of the POA exits the cell and, providing the media pH is acidic, on protonation re-enters as protonated POA, which may help to disrupt membrane potential. The principal adverse effect of pyrazinamide is a hepatic reaction. Hepatotoxicity appears to be dose related, and may appear at any time during therapy. Gastrointestinal disturbances including nausea, vomiting and anorexia have also been reported. PZA is contraindicated in persons with severe liver damage or with acute gout.